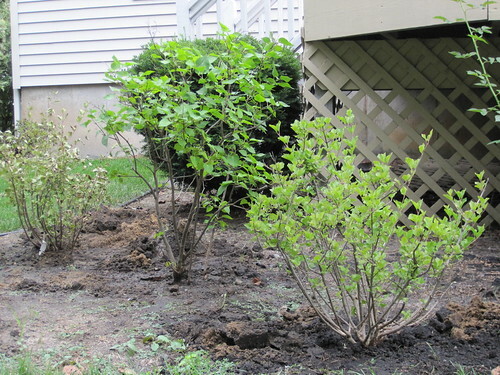 I finally got around to planting my lilac bushes, my mother's day gift from 2009. I brought them from the old house and they have definitely seen better days. The one on the left was drowning in its pot. For some reason it wasn't draining well. That's what urged me to finally dig the holes. I hope it comes back now that it can breath a little better. Now I'll have to smooth out the extra dirt and get some landscaping fabric and some kind of ground cover. You know, I could really use a gardener. If anyone has some free time let me know.